Fiology thanks Airmen Mildollar of Military Dollar for shaping this lesson. Transportation is one of The Big Three and can have a significant impact on your Financial Independence journey. 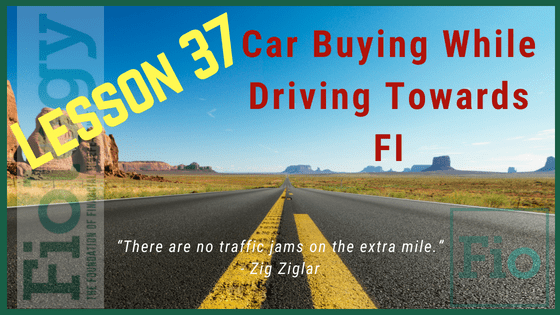 If you have determined that you absolutely need/want to have a car, then it is important to understand the process and the many factors, price included, to consider when the time comes to shop. Buying a new (or new to you) car can be stressful. How much should you spend? New or used? Compact gas saver or built-like-a-tank SUV? I moved to Washington DC in 2016 and sold my car after a few months because I didn’t need it – I walked almost everywhere and spent about $15 per month on other forms of transportation. I was sad to see my old car go – it was a great car, reliable, good gas mileage, and paid off! When it came time to buy a new car, I looked online for tips and tricks. Some were helpful, but some were not. I did all of the “right” things written about in major media, and wasn’t having any luck getting close to the prices I was expecting. I tried the method of gathering quotes from dealers by emailing them and asking for their best price. However, what I found is that I kept receiving quotes for much more than my research showed I should be paying. Eventually I modified the tactic. Instead of asking dealerships to send me quotes, I gave them a number and had them tell me whether they would sell me the vehicle at that price. Once I switched to this tactic, I had a lot more luck. I owned a car – at the price I wanted and significantly less than I was being offered – within 8 hours of taking the initiative this way. Note: Everybody knows car prices vary by make and model, but location makes a difference too. You might pay $500 more or less to buy in your hometown vs two states away. Using sites like this helps you take this into account. Take Action: Once you have a reasonable price in mind, email local dealerships and tell them the year, make, model, and trim level of the car you are looking for and give them your “out the door” price. Make sure you include any options that are important to you, such as upgraded safety features, technology, and colors. Then, wait to get a response that works for you. Explore: True Car – Get the TruePrice – the actual price you will pay at the dealership.